This felt panel is the starting point for many projects. It could be made into a wall hanging or sewn onto a bag or cushion cover. The Pearl Maker pens are so versatile and work on a range of surfaces. They don't crack on flexible surfaces like felt. Draw a design in your visual diary first so you don't make a mess on the felt. 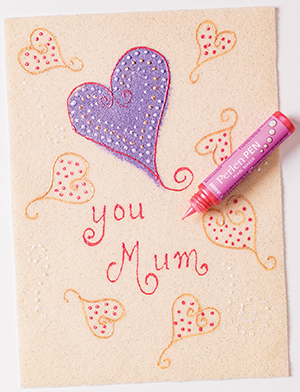 Decorate your piece of felt with Shimmer paint for large areas and use the Pearl Maker pens for outlines and details. Remember to leave space around the edges if you plan to sew it onto another project or to make it into a wall hanging. Add stitching and embroidery techniques or sew some sequins on, to make this project extra special for Mum.